The Evanescent Wave Imaging System utilizes evanescent waves to excite single molecules in the thin section in contact with the coverglass. Nikon's high N.A. TIRF objectives make it possible to introduce laser illumination at incident angles greater than the critical angle (θc) resulting in TIR that creates an evanescent wave immediately adjacent to the coverglass-specimen interface. The evanescent wave typically reaches less than 100nm into the specimen and its energy drops off exponentially. Because the specimen is not excited beyond the evanescent wave, this imaging system can produce fluorescence images with an extremely high signal-to-noise (S/N) ratio. 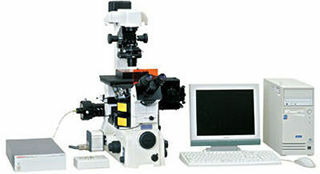 The unique extendible "stratum structure� of Nikon's TE2000 inverted microscope permits simultaneous mounting of both TIRF and epi-fluorescence illumination systems, with no restriction on their individual capabilities. It also allows their dedicated filters to be used independently. Moreover, switching between the two systems is elementary. Nikon has developed a dedicated 60X TIRF objective, the first lens in the world that corrects for temperature changes. By using a coverglass thickness correction collar, you can easily correct temperature-induced changes-from 23'c (room temperature) to 37'c (physiological temperature)-in the refractive index of the immersion oil that can cause spherical aberration. Under the SRIC method, only the areas in contact with the coverglass are rendered in black within the specimen. 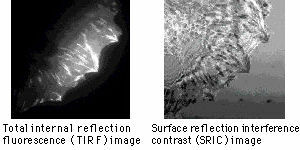 With Nikon's TIRF system, the SRIC method can be easily used by changing the combination of epi-fl filters. This makes it possible to check whether or not the specimen should be visible by TIRF before fluorescence excitation. This eliminates the risk of photo-bleaching during focusing. Then, you can easily switch to TIRF observation since both TIRF and epi-illumination systems are simultaneously mounted.